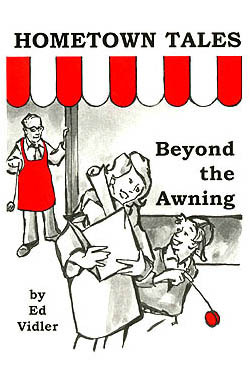 When East Aurora businessman Ed Vidler introduced his nostalgic book From Under the Awning in 2003, he had a local hit on his hands. Vidler's entrepreneurial instincts have inspired a brand new book that serves up another round of touching, amusing and insightful stories about life in small-town America. Hometown Tales Beyond the Awning is a delightful jaunt down memory lane. Vidler's pithy anecdotes recall times when East Aurora's snow-clogged sidewalks were cleared by horsedrawn plows. He talks about the art of porch-sitting, random acts of kindness and family baseball games. Who Says I Eat Dog Food? After more than a half-century, Vidler works at the first and only job he has ever had -- at Vidlers 5 & 10. He estimates that he swept about 500 miles of floor space during that time! The consummate clerk, Vidler believes that dealing with people is the greatest job in the world. His new book captures his enthusiasm and good humor.